I've been in my new home for 3 months now and I am in love with it. The kitchen stinks because it's tiny and there is no dish washer and we need to install a garage door opener, but other than that this house is dang fab! A lot of our stuff didn't make the cut when trying to figure out what to pack, simply because lots of things were cheaper to purchase new than to move. Add on top that Rob and I wanted to pick things out together to decorate our first home together and only the most loved decor items actually made the cut. Now that we're fairly settled we're starting to decorate together. I've always let my master bedroom fall by the wayside, instead choosing to spend decorating money on other rooms of the home that guests actually visit but after decorating the old master to stage it to sell, we realized just how awesome it is to have a beautiful bedroom! 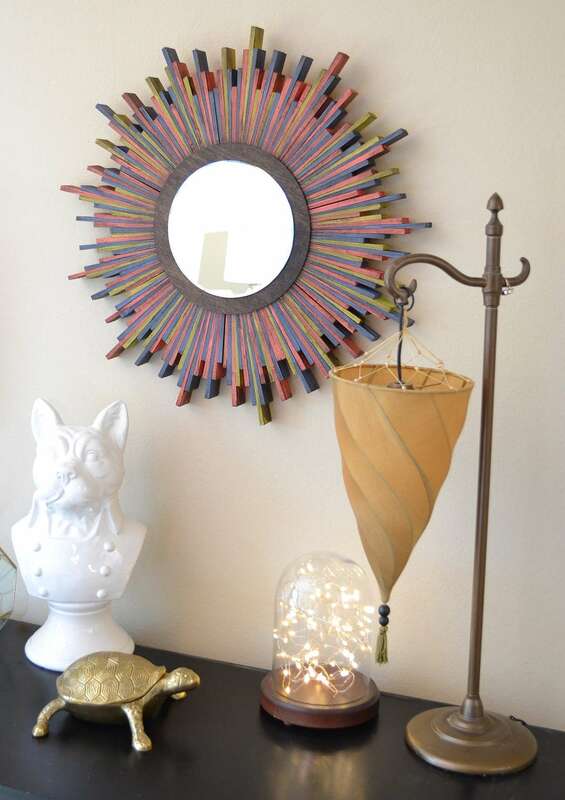 This mirror is the first of many DIY touches being added to our modern decor bits we've picked up here and there! 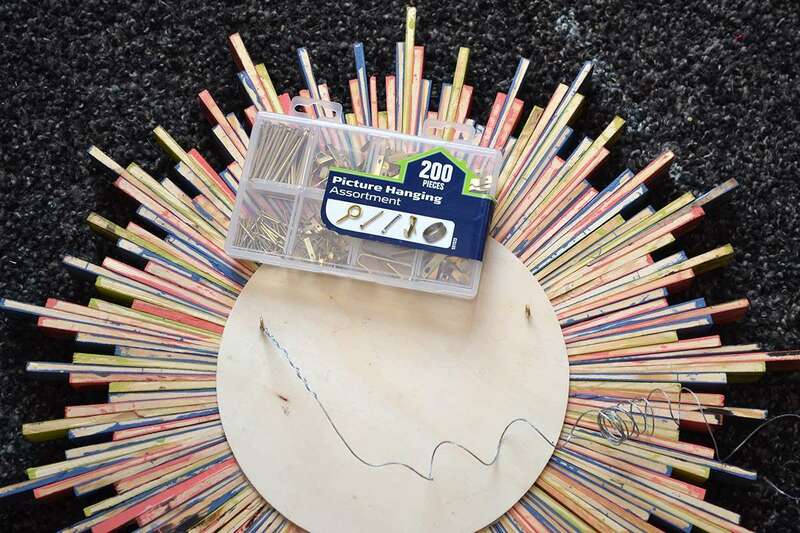 You'll need approximately 16 packages of wood shims from the hardware store. I paid around $1.70 per package. 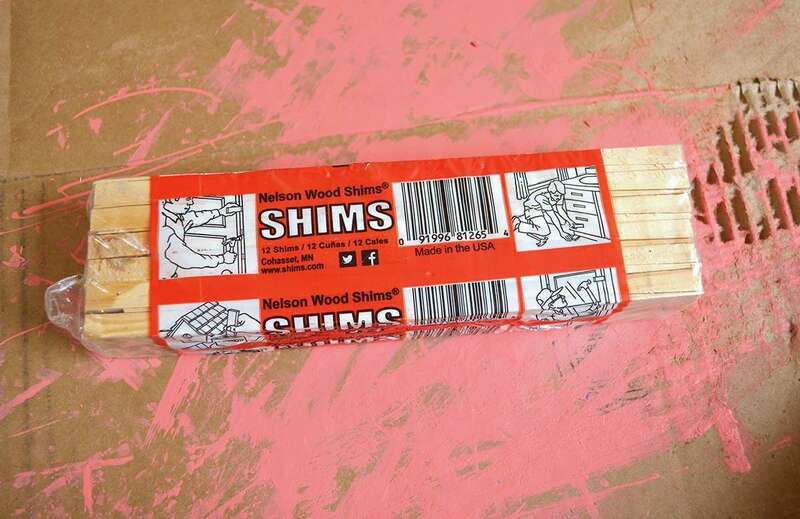 Be sure you purchase wood and not composite shims. 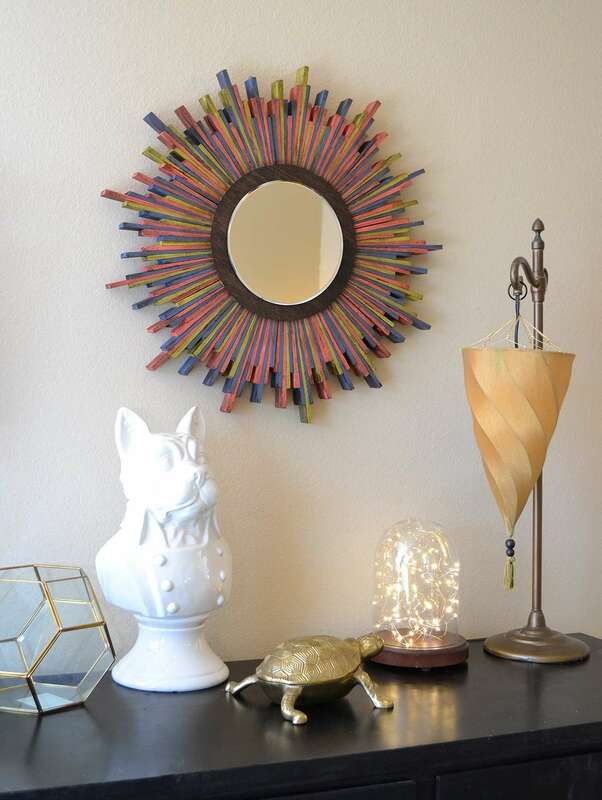 Paint all of your wood shims. If you hold them together the same way they came out of the package you can quickly and easily paint the tops, bottoms and front of them all in one go. Then you'll need to paint approximately half of the shim from the fatter side down. 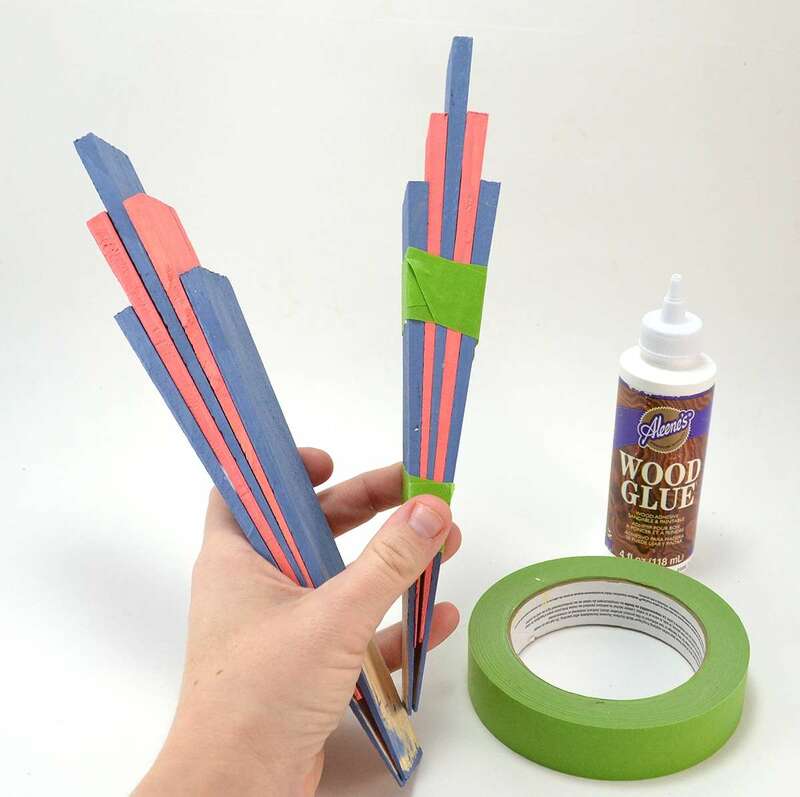 Grab your Aleene's Wood Glue and get ready to start forming the sections for the starburst! 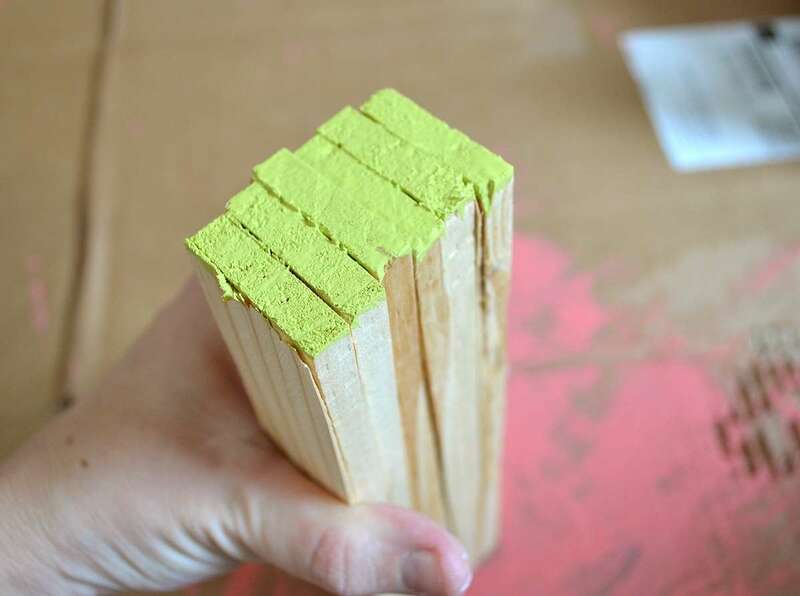 You'll piece 5 shims together for your first set of sections. The middle will the the tallest and flanked by 2 shorter and then 2 shorter still. 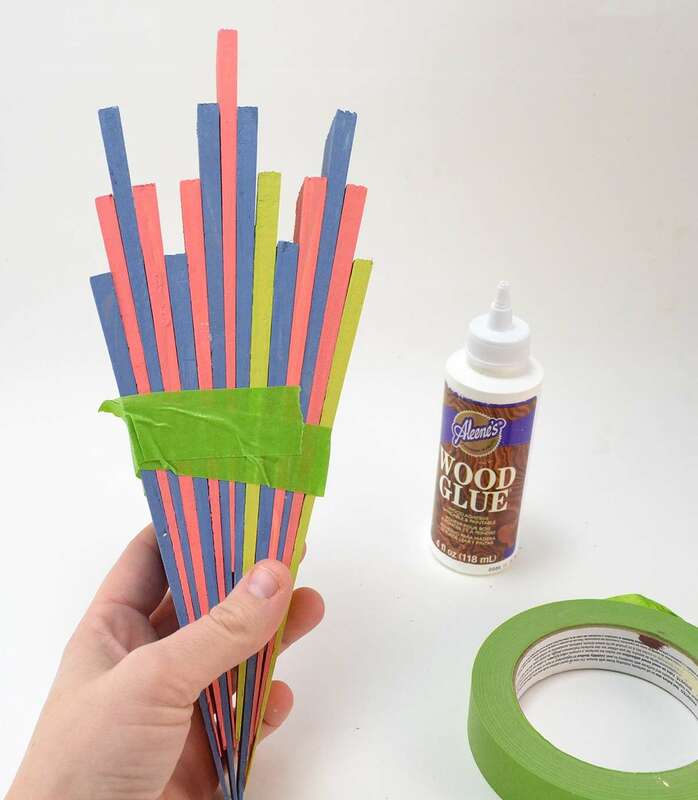 Tape each set together with masking tape and set aside to dry completely, preferably overnight. 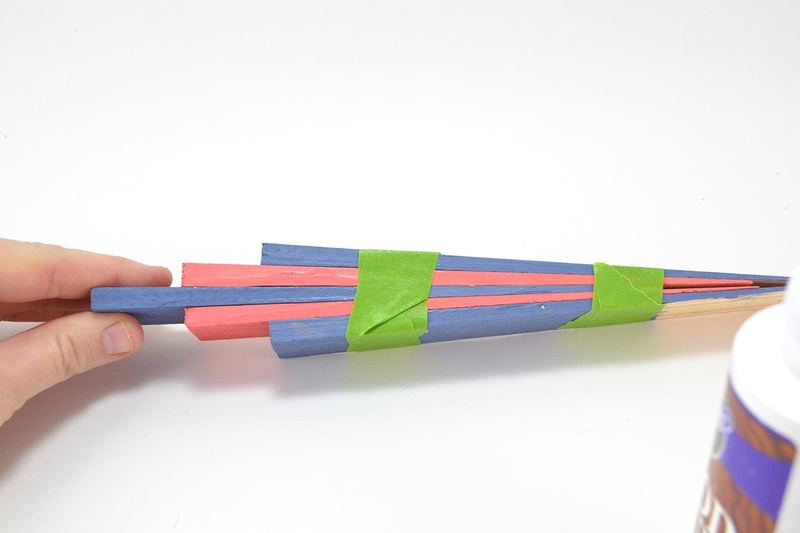 Continue building your starburst shape by attaching sections together. To make the interesting shape you'll want to imitate the look above. Tape each section together and allow to dry, overnight is preferable. 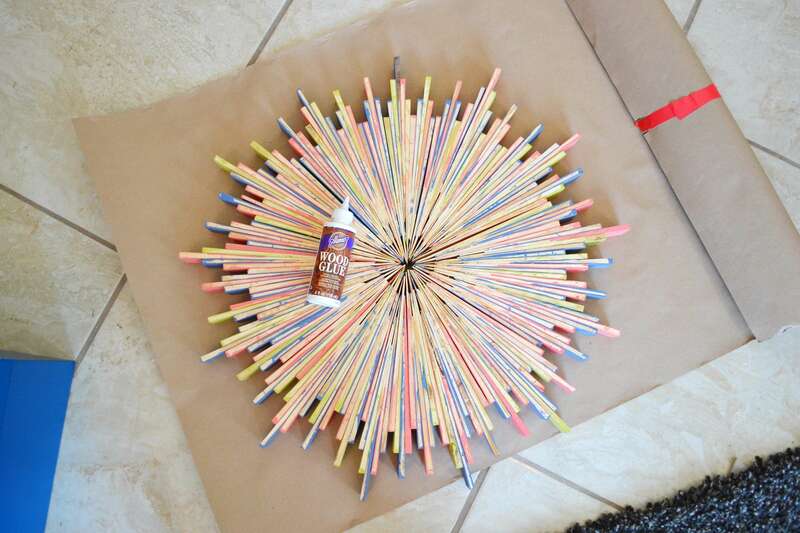 Once you get these larger sections it's time to glue them all together to form your circular shape. 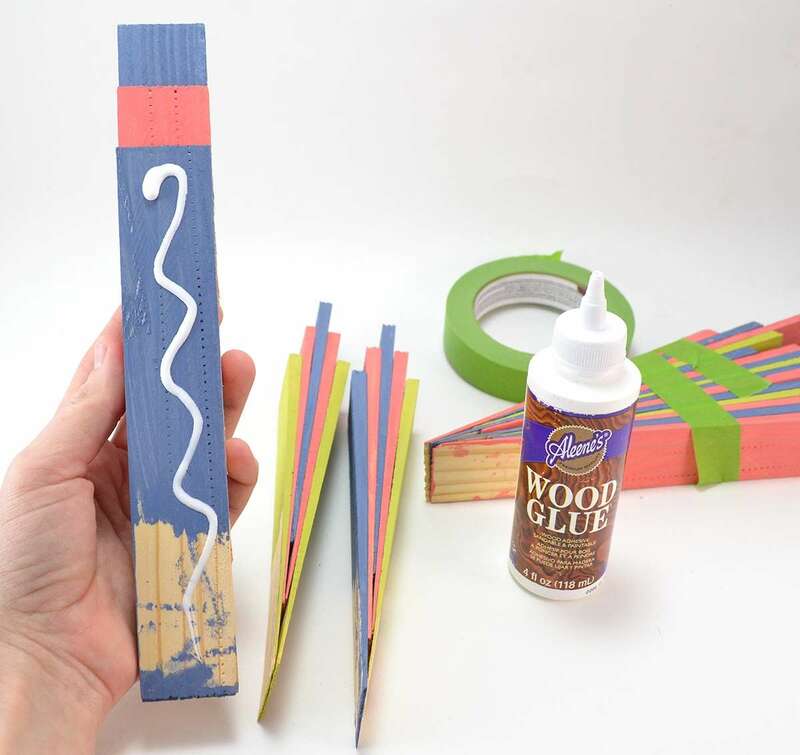 If you haven't let your sections dry all of the way, you're going to find yourself in a bit of a pickle as things are going to try to come apart on you, so be sure that these guys are totally dry before removing the tape from every piece! Flip the entire thing over, fitting it together nicely. Now some shims aren't 100% perfect so you might have a few gaps. If you're worried about this pay better attention to each shim as you build out your mirror. I only had 6 shims left over when all was said and done, so if you want to be selective be sure to grab another package of shims for backups. To help brace our mirror we are going to add wood to the backside. 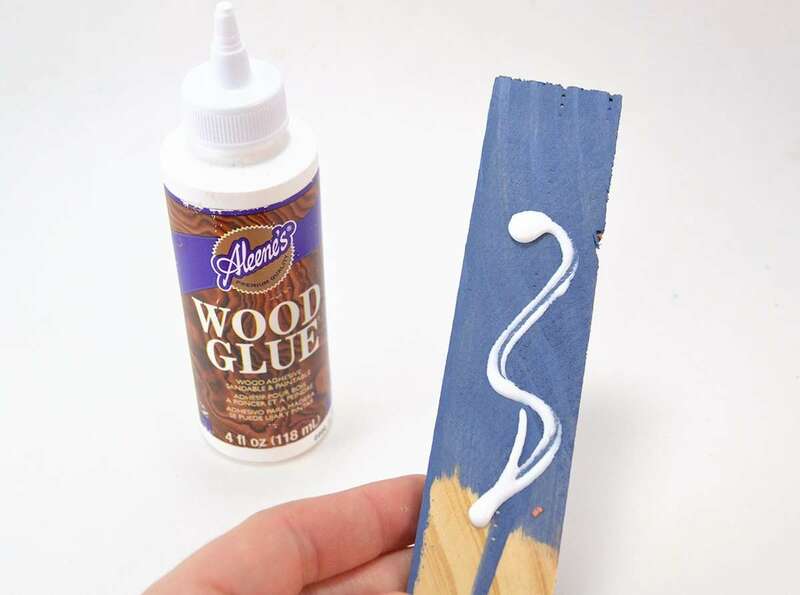 You can do this while the glue from the previous step is still wet. 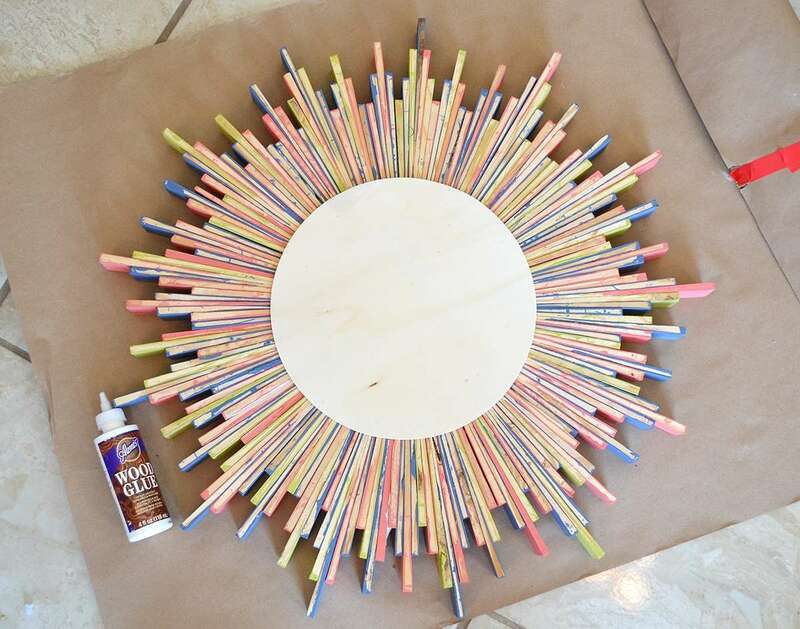 Place an ample amount of glue onto the circular wood piece and then place on the center, back of the starburst. Place heavy books, or other weights, onto and allow to dry, at least overnight. 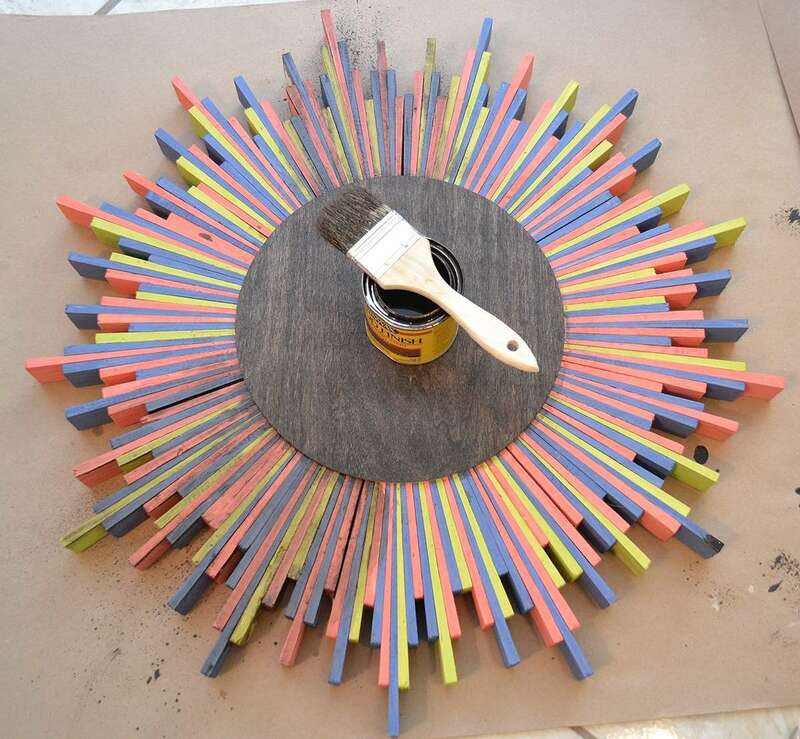 Glue a second wooden circle onto the front side and allow to dry, at least several hours. 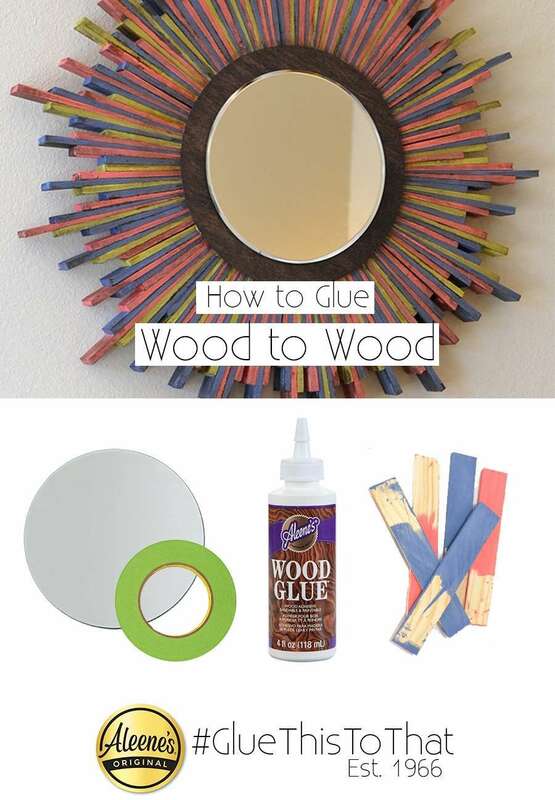 You'll find these circular pieces in the woodworking area of crafting stores. To add some interest to this piece we're going to distress it a bit with some wood stain. Anything from medium to dark will work, but be sure to test a sample on an unused, painted shim to be sure you'll be happy with the results. 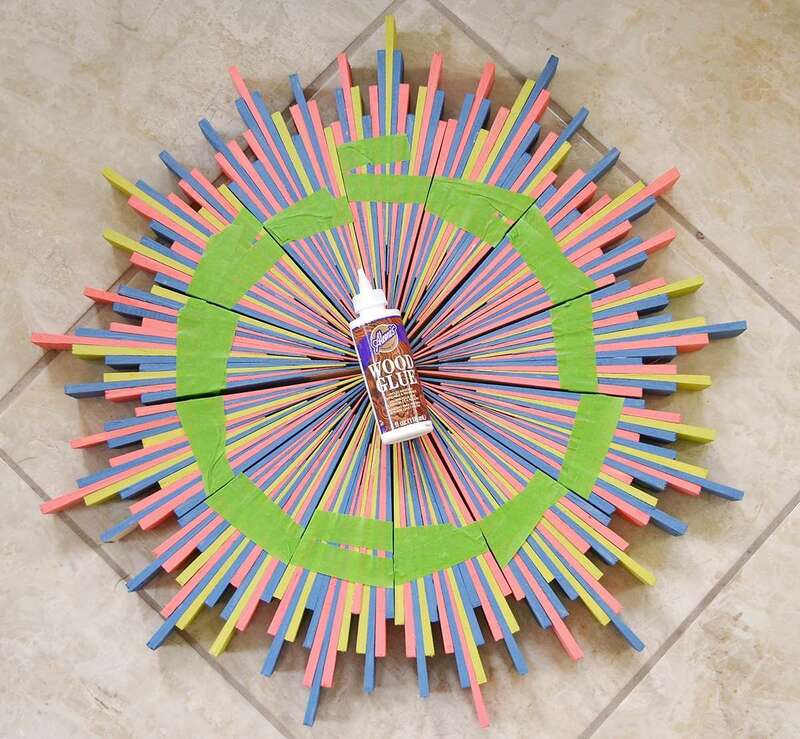 Fully stain the center wooden circle and then brush on and quickly wipe away stain onto the colorful shims. Repeat as many times as necessary to get the amount of distress you're looking for. 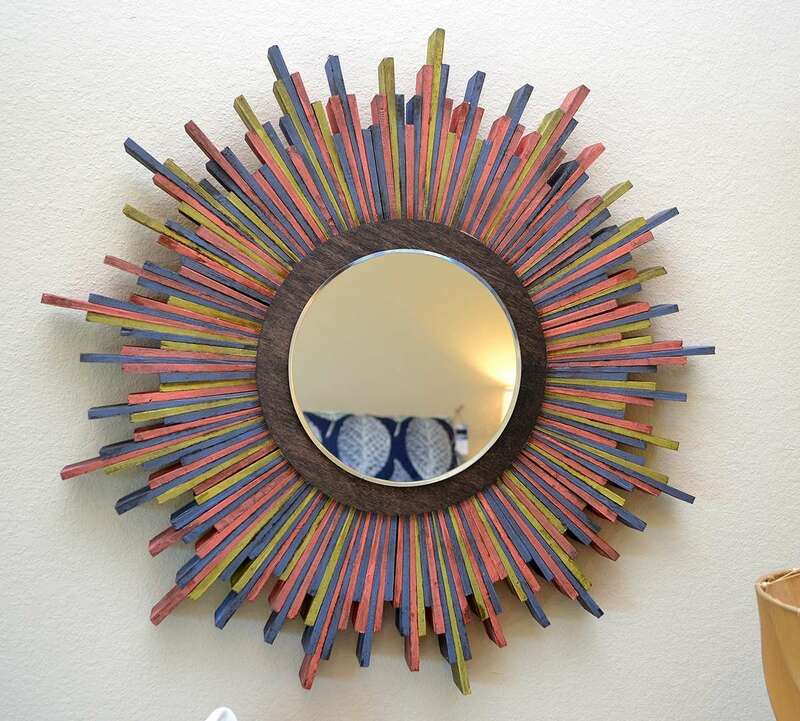 To finish use hook eyes and picture wire to the backside of the mirror. This guy is super heavy so be sure to hang appropriately. Mine is hung on a large screw going straight into a stud. If you don't have a stud where you plan to hang your mirror, check out 60 pound Monkey Hooks. Those things are fab! Lovely! My new little home is coming together quite well!